Yokohama Stadium:ã€€Sri Lanka came from behind and won, thanks to 13 steals causing defensive mishap.ã€€In 6th inning, Nadun of Sri Lanka hit and stole 2nd base, followed by walk and sac bunt sending the runners to 2nd and 3rd bases, and two-run triple by Deeshan to left field tied the score. Sri Lanka added runs by errors and scored additional 4 runs in 8th inning with 2 hits, 4 steals, sac bunts and errors.Jayasiri pitched with patience. Thailand hit the same number of 9 hits as Sri Lanka including 3 hits by 4th batter Ki Aoyama and had more big hitters, only to be blown defensively. 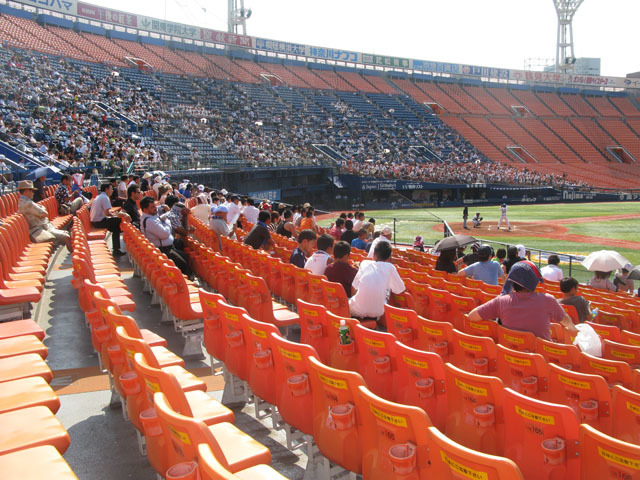 Hodogaya Stadium: 17-0 win in 7th inning enabled Korea to advance to 2nd round. In 3rd inning, Korea collected 5 runs beginning with 3 baser to the right field line by Kim Jun Tae and 5 more hits and added another 5 runs by 6 singles and 4 stolen bases. All the 9 players contributed to 20 hits for Korea. Pitcher Turaray of Philippines kept Korea scoreless in the first 2 innings. Philippines defense is comparable to Korea with accurate throws and catches. They hit every inning from 4th to 7th and nearly scored in 6th inning with runnes on 1st and 3rd bases with 2 hits in 6th inning. Yokohama Stadium: Japan is qualified to advance to 2nd round after winning the game with 18 hits and 34 runs to end in 5th inning. Starting pitcher Abudullah of Pakistan allowed 10 walks and16 runs facing 21 batters in the bottom of 1st inning. Japan added runs consistently including an over-the-fence homerun of Yokoo. Abdullah, 3rd batter for Pakistan, hit in 1st inning to centerfield, another one on the day before against Chinese Taipei, followed by a walk making two runners on bases which . In 5th inning, Momin of Pakistan walked after 2 outs. Although Pakistan lost by a wide margin again, they played better than they did on the day before.